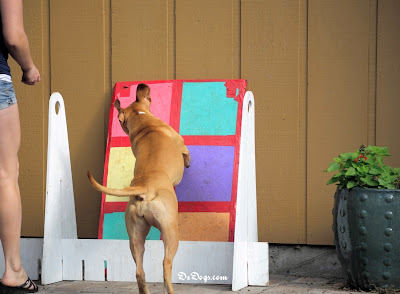 DZ's Adventures: Flyball Friday - Bounce Baby! 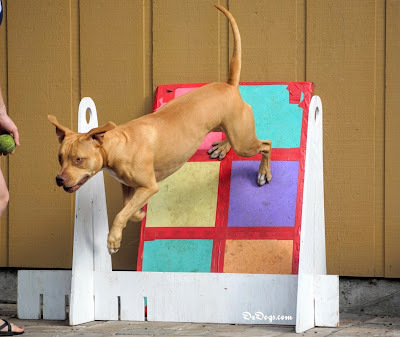 Flyball Friday Pt - 4. This past week our homework was to continue working on our wall bounces, dead ball retrieval, and to introduce the flyball box (box bounce), if all that went smoothly we were to try incorporating a dead ball retrieval with the box bounce. Last weekend we had the pleasure of going to an actual Flyball Tournament at a local fairground, our trainer over at So Fly and her club was competing. Oh my dog! It was soo much fun! The dogs absolutely love the sport, and I guess the running joke is that flyball dogs are out of control. But really they are just excited and ready to run, they are under control and were so much fun to watch. Any dog breed, and any size can compete. We saw everything from tiny little Jack Russel's, Beagles, lots of different bully mutts, a couple American Pit Bull Terriers, and even a Great Dane competing! The enthusiasm alone in the room was electrifying. We can't wait until we're good enough to join a team! I would say that hubby and I are officially hooked, a big difference in flyball and agility is that in agility you might get a couple runs in (depending on what you sign up for), but in flyball you can potentially run off and on all day. The dogs get lots of breaks in between runs but it is a very active day, that leaves both humans and dogs wore out by the end. Here is Dante's improved wall bounce! You'll notice he is turning much tighter and the board is completely vertical. We also decided it might be fun to train Ziva and Jack as well! We would love for him to find a home that would continue to work with his brain and/or maybe put him into a sport! With Ziva's recent knee issue we are also thinking flyball might be a better sport for her than agility because it is easier on the knees, most of the impact from jumping is on the shoulders. So far so good! No limping, and she has a beautifully tight turn! Since this picture was taken we've also worked her into a completely vertical wall bounce. My trainer was also nice enough to let us borrow her flyball box to practice our box turns. It's the same concept as the wall bounce just that it is on a smaller surface, and much lower. After a few days we finally got Dante to start putting the pieces together and now his box turn looks pretty good! We've also been working Jack and Ziva on the box turn. Jack got the turn ridiculously fast, he's such a smart boy! Ziva began by running all the way up the box and standing on top, silly girl, but today she was successfully doing her own box turns! My husband was joking saying, "One more dog and we could have our own team!" Hmm....that would be pretty funny. They look like they're having tons of fun! Such a blast! Maybe you guys should consider it! Went to hang out at a flyball competition. It looks like the dogs have a ball! And they were so excited that they barked and barked! SO interesting that flyball is easier on the knees. It makes sense; I just never thought that through. They're doing an incredible job. Way to go!! So fun!! Thanks!! 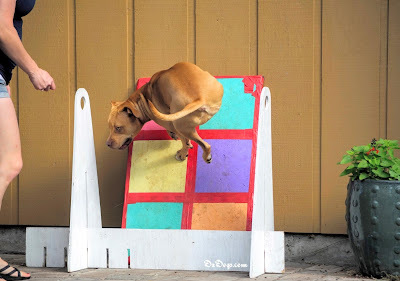 And yes, if you think about it, all the skidding, and tight turns involved in agility as well as her running like crazy for a ball at home can be very stressful on the knee joints. Yeah, I say get your own team together! Great vids - thanks for sharing. Wow! A Great Dane! I would have loved to see that. I love Fly Ball competitions. It was WAY COOL! He certainly drew quite the crowd when he came out for his turn!! Isn't it just so fun and rewarding to work on sports together with your dog? Good for you! Keep it up! Thank Emma! I've always loved sports, it is such a blast though to be able to do sports with my pups! How super awesome! I loved the videos and pictures you posted. I've never been to a Fly Ball competition, but your post made me want to go to one!! You certainly should! I bet you can find one somewhere near you! You're so right about the energy level at a fly ball competition. It is amazing. All the pups look great. And I loved the stills of Ziva doing her turn. Too bad we're not closer. I bet Honey would love to join team DZ Dogs. Aww bummer! Honey would certainly be a fun addition to train up!